Interested in Triumph TR2, TR3, TR3A, TR4, TR5, TR250 or TR6? Do you own one? Would you like to own one? Whatever your status, make sure you visit the RevingtonTR Blog and facebook sites. If it’s parts, workshop support or information you are after, somewhere on our blog or website is the information you are looking for. 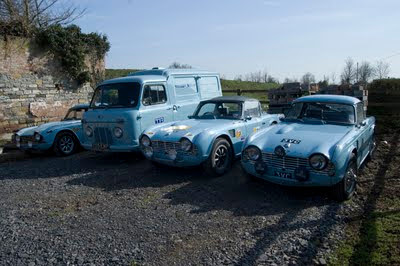 Whether its concours, standard spec, fast road rally or race, we can help. Whatever stage of build or development you are at, we can help. Visit our blog or web site and give us a call. Our friendly team will try to assist you at every stage of your cars life. Click on our blog or facebook links. If you like what you see, don’t forget to “LIKE” what you see. We hope to speak to you soon. Works Rally Cars 6VC far left, replica support van, Neils Targa rally car and 3VC far right. For More information on RevingtonTR or parts and services we supply please contact us on the number below.